Father Bonaventure Cumiskey, or Fr Bon, as he was fondly known, was chaplain in Glencairn from 1981 to 1990. Born in Kells, Co. Meath, in 1922, he entered Mount Melleray Abbey in 1941, made his solemn profession in 1946 and was ordained to the priesthood in 1948. Short in stature (“like Zacchaeus,” as he often reminded us) he was big of heart, kind, simple, and full of faith and joy. During his time in Glencairn he not only performed priestly duties but also acted as chauffeur to any sister who needed to attend hospital or other appointments. No matter how many times a week he had to drive to Cork or Waterford, he remained patient and good-humoured. He was also beloved by our neighbours, and by the Carmelite sisters in Tallow where he regularly celebrated Sunday Mass. A passionate supporter of Meath GAA, and a collector of Meath memorabilia, Fr Bon loved Ireland and the Irish language. He loved people. He loved being a monk; he loved being a priest. Most of all he loved God. For the last few years he was cared for in the Padre Pio nursing home, Cappoquin, a short distance from Mount Melleray Abbey, returning to the monastery occasionally to celebrate community events. The most recent of those was in February of this year, to celebrate the 70th anniversary of his own ordination. Some of our sisters attended this very joyful event, which was characterized by Fr Bon’s immense gratitude to God for allowing him to serve in the priesthood for all those years. 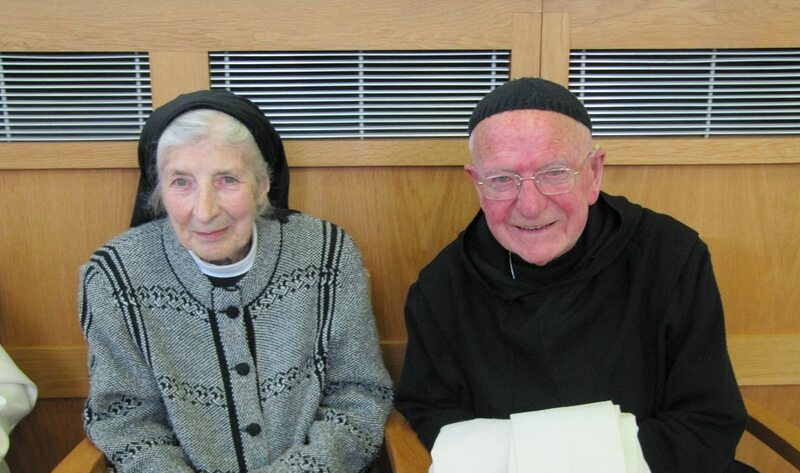 Shortly before Easter he was taken ill and transferred to the Bons Secours hospital, Cork, where he died peacefully on April 4th, Wednesday of the Easter Octave, aged 95 years. Some of our sisters attended the funeral Mass and burial on Friday 6th, joining with a large congregation who came from near and far to commend our brother to the Lord. Very sadly missed. A distant cousin with whom I communicated for a few years. I always enjoyed his wry sense of humour. Sadly wasn’t aware of his passing in April. May he rest in peace.